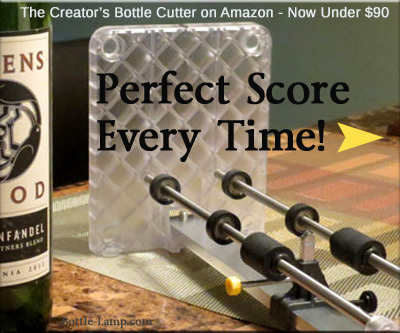 If you are looking for a methodical way to cut glass bottles, with consistent cuts, then let me introduce you to a bottle cutter that does exactly that. The Creator’s Bottle Cutter (CBC) was mailed to me by the inventor and upon arrival I inspected the conforming box that the device came in. 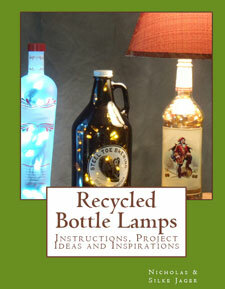 A full color attachment showed the bottle cutter and a few of the projects that you could create using cut bottles. The box was surprisingly light weight and the cutter came turn key out of the box. I was more than ready to begin scoring. The Learning Curve – I was a little confused at first on how to properly use this bottle cutter and this resulted in less than adequate scoring. It was my apprehension of pressing on the bottle that ended up being the problem. The scoring wheel sits on a spring that regulates the amount of pressure that’s being put on the bottle. You can’t really press too hard… since the bottle is resting on the rollers that’s as far as you can push it. The Technique – By lowering the scoring wheel and tightening it down you are ready to position your bottle. Once the bottle is in position you simply release the scoring wheel and allow the spring to push it up against the bottle. Carefully rotate the bottle around the base, holding down on the main part with the sheathing device and rotate the bottle with your other hand. After I figured out the proper technique I was ready to go. It was very impressive to see consistent cuts coming off the CBC device. This alone was gratifying to me, but the CBC is so much more. Once you set the device in the upright position you will notice a measuring scale that shows the length of your cuts. Being able to regulate the length of each cut is huge when it comes to doing bottle crafts that have multiple, identical length items. I’ve always wanted to create a pendant light with multiple cut bottles on it. I want to have them all cut to the same length. Just like the beer bottle glass sets would seem a little strange if one glass was taller than the others. “Mom, how come Billy always gets the taller glass! ?” Once I figured out how the Creator’s Bottle Cutter worked I was ready to try different things like cool looking pendant lights that I wasn’t able to do with any of the other bottle cutting devices that I had used. 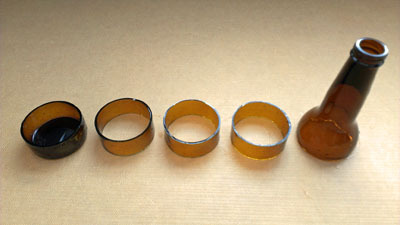 The picture below shows multiple scores on the same bottle with 1″ high rings. Given the length of the beer bottle that I was working with I ended up with a top and bottom with three perfectly sized rings upon completion. The scores went down perfectly and the separation was flawless. I lined all of the pieces up and marveled at how easy the whole cutting process was. Finishing – Taking a light grit, wet sand paper to the edges of the cut bottle is highly recommended. Little shards are usually left behind after making the break. You want your edges to be smooth, not only for the end user (nobody wants a bloody lip), but for the look of your project as well. The separation on all of the score lines I did was so precise that I really didn’t need to spend a lot of time sanding the bottle edges. I simply smoothed out the edges. 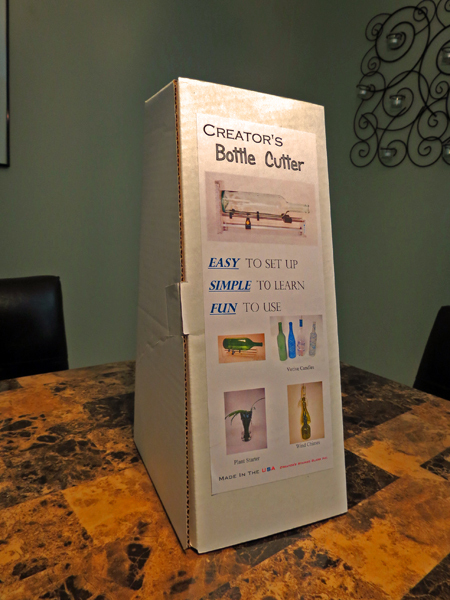 With the ease in which you can score and separate your bottles, I found the Creator’s Bottle Cutter to be the perfect glass cutting tool for the types of projects that I wanted to put together. 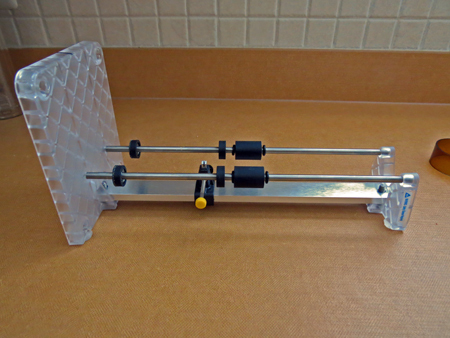 With a price tag of under $80 you are getting a top of the line bottle cutter. Sturdy and easy to use, you will have a glass cutting tool that is built to last and will provide you with a consistent performance. This was huge for me given what I intended to do with it. I have been able to get other devices to separate glass before but no two pieces were ever completely identical. 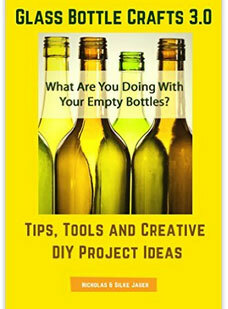 The Creator’s Bottle Cutter will allow me to make all of my thought up bottle craft projects a reality. I had a chance to talk with Ray Nicholas, the President of Creator’s Stained Glass Inc. Along with the CBC, Ray has also invented numerous other glass cutting devices, like the Bottle Neck Cutter and the Linear Scoring Module, as well as other useful items that can all be found on his company’s web site. In conversation we talked about all the time he puts into creating his patented devices and how he likes to tinker with things. Ray is always trying to improve upon any given product! All of the Creator’s products are Made in the U.S.A.
Share your bottle cutting experiences with us, good or bad, in the comments below. You’re absolutely right. Thank you for pointing that out. I want to make a pendant light. Which bottle cutter should I get? Lol, maybe throwing the G2 cutter to the side like that was a little over the top. Making it a prop in the video was probably the most useful thing it ever really did for me. And on that note . . . . . . If your intent is to only make a pendant lamp and maybe cut a few other bottles for similar projects, you could use the Kinkajou. 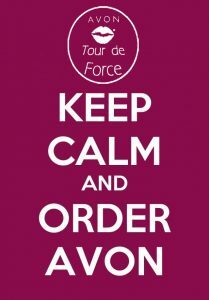 The cost is middle of the road and it will get the job done for you. If you’re planning on selling these things or mass producing them, then I would suggest the Creator’s Bottle Cutter. 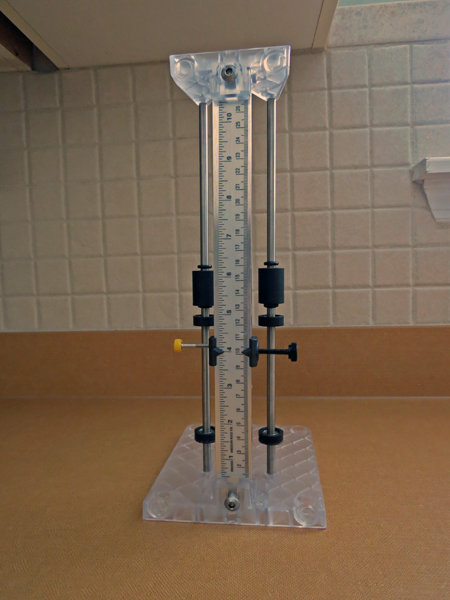 You will be able to set it up to your desired height and always have those consistent lengths on all of your crafts. What do u use to cut a square bottle or odd-shaped bottle?? push the bottle against the cutting wheel while rotating it. When you get to the corner, just carefully go around the corner while pushing the bottle against the wheel. I have square bottles that I am trying to score with the Creators Bottle Cutter. I can get the corners and some of the sides, but I am having a problem getting the blade to reach the middle part of the sides, its too short. Also, I have Jack Daniels bottles, which as you know are quite ornate, and I keep getting cuts that are not even. Please help!!!! Thanks Nick. In your comments above you mention mass producing cut bottles. If you’re going to sand down one or two, then sanding by hand will work just fine if you are patient. But if you’re going to be sanding down many of them you might want to check out the Bottle Bit. It lets you spin the bottle around like its on a lathe so you can sand it quickly. Not having much luck with square bottles, they seem to keep cracking everywhere except on the score line(using hot water / ice water method). I am using a creators cutter, nailing round bottles but not square. Should I try going over the score a few times instead of just the once? DO NOT be excessive in this as you could ruin the cutting wheel. And do not go back and forth on the score. Only score in one direction. additional sequences of hot and cold. Thanks for your extremely helpful videos. I’m about to purchase this bottle cutter but need to answer one question: How close to the base of the bottle will the Creator’s Bottle Cutter let me score? My project requires a score line that leaves almost no wall above the base. Any advice you can offer is much appreciated. Thanks again! Josh, When I began cutting beer bottles my critical requirement was to be able to cut beer bottles very close to the bottom. Creators bottle cutter allowed me to do that. If you want to get less than an inch just use a wooden shim about 1″ thick. I picked one up from the finished hardwood isle at Home Depot where they sell them for $1. I typically cut about 1/2″ to 3/4″ from the bottom of the bottle. Some bottles won’t let you go much lower because they have a thick glass bottom. Here is a photo of some beer bottles I regularly cut with Creators product. You can get as close to the base as you want depending on the bottle. push the bottle up closer to the blade in relationship to the base. I understand what you need, and the Creator’s Bottle Cutter will do that. Also, you can call me anytime 847-477-3863 for help. I have been doing glass for 20 years and know what it takes to get that perfect score. I got you bottle cutter for christmas and am using the candle and ice water method to seperate the pieces. The cut is clean, however the however the lower part of the bottle always cracks or splinters. I followed your video and timed it excatly but having no sucess. Perhaps you are turning the bottle too slowly or the candle is too close to the glass. It is definitely an overheating problem. I am very interested in purchasing this cutter. One question…..does it cut bottles lengthwise? And if so any tips? HI i need a head cutter replacement . sorry about my english . You can find the replacement carbide cutting head for Creator’s products right here on Amazon – http://amzn.to/1NOAgzE. If you have questions about your bottle cutter please contact Ray via his website’s contact page: http://www.bestbottlecutter.com/make-your-reservation.html. This sounds beyond delicious! It really captures the essence of Spring!